Agatha Christie was born in southwest England to a wealthy upper-class family. Christie was schooled at home and was an avid reader from a young age enjoying books by Edith Nesbit and Lewis Carroll and, later, mystery novels by Wilkie Collins and Sir Arthur Conan Doyle. 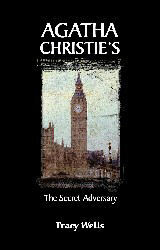 The Secret Adversary (1922) was Christie’s second published novel and introduces the detective couple, Tommy and Tuppence, who form The Young Adventurers, Ltd and appear in three other Christie novels and one collection of short stories. Christie included dedications in only two of her novels, both of which featured Tommy and Tuppence. Her dedication in The Secret Adversary reads, “To all those who lead monotonous lives in the hope that they experience at second had the delights and dangers of adventures.” The only other dedication appeared in her last novel featuring Tommy and Tuppence in 1968, By the Pricking of My Thumbs. The author of 66 detective novels and 15 short story collections, Christie is best known for her bestselling novel And Then There Were None and her play The Mousetrap.